For thousands of years, Native American peoples gathered at the "great meeting place," the Columbia River Gorge, to fish the bounty of salmon. Their rock art, mostly spiritual petroglyphs, can still be found there today. In 1867, early pioneers of the Willamette Valley chronicled their Oregon Trails on a hemlock stump. In City of Portland, the earliest recorded example of ‘graffiti’ was the Lovejoy Columns, painted by Athanasios "Tom" Stefopoulos from 1948 to 1952. Stefopoulos, a Greek immigrant and a watchman for the SP&S Railroad Company, painted whimsical images of doves, owls, lions, anthropomorphic trees, and Greek mythical gods on the overpass columns during idle times in the yards. Although this was technically illegal, his art was allowed to remain for decades. The pillars were postcard favorites and seemed as much a part of the city’s landscape as the Hawthorne Bridge. They were immortalized in Gus Van Sant‘s opening scene of Drugstore Cowboy and Elliott Smith‘s film Lucky Three, both symbols of Portland‘s grimy underbelly. In 1999, when massive redevelopment swept through the area, the yard and overpass were demolished. Thanks to extensive community advocacy by Portland architects and artists, ten of the painted columns were preserved and re-incorporated into the new Pearl District urban landscape. Read more about the Lovejoy Columns here. With its abundant low-lying commercial buildings and ample wall space, Portland had a vibrant mural scene during the 1980s. In 1982, an anonymous group of artists formed Gorilla Wallflare. Their first attack was at the corner of SE 12th and Division. Tired of seeing this dull blank wall, they took matters into their own hands and painted a large yellow banana with the slogan Art Fills the Void! on the wall. Out of all the groups‘ guerrilla murals, this is the only one still in existence. The owner of the building was surprised, but decided to keep the mural. Art Fills the Void! is Portland‘s oldest surviving mural today. Art Fills the Void! is an excellent example of how a community can embrace illegal street art and shift the perception of it into something positive and valued. Read more about Gorilla Wallfare here. Portlander’s used to be able to paint on anything they had authorization from the owners to paint, without a permit or fee. This openness could have been thanks to Portland‘s pioneer roots, general acceptance of alternative lifestyles, and support for public arts. According to the Portland Police Bureau, Hip Hop style graffiti made its way to Portland, from Southern California, in the mid-1980s. Through the 1980s and 90s, Portland had several well-known graffiti sites including the pedestrian subway under SW Front Avenue near the Ross Island Bridge and the tunnel where SW 18th passes under Highway 26. These tunnels were described as having scrawlings so rampant and thick that digging out any meaning took meticulous archeological effort. These free public art exhibits no longer exist today; both tunnels are buffed on a regular basis. Portland once had over 1,500 "grandfathered" murals, but far less exist today. Portland has a rich history of traditional community murals. Some of the oldest date back to the mid-1960s. 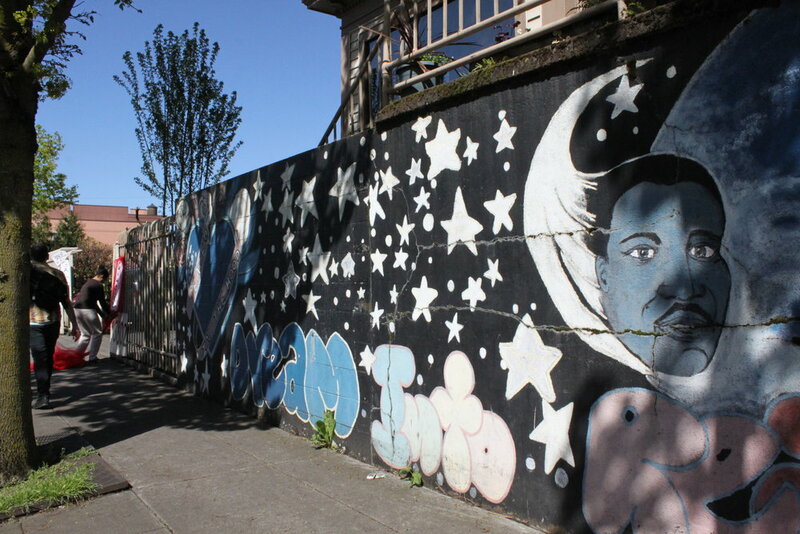 Isaka Shamsud-Din is Portland's best-known African American muralist. A lifelong community organizer, Shamsud-Din was a founding member of San Francisco's Black Panther Party, a local leader of the Nation of Islam, and a teacher at Albina Art Center and Portland State University, where he established the African American Visual Arts Scholarship in 2003. From 1971 to 1978, Shamsud-Din's Albina Mural Project documented and produced several large scale community art murals depicting stories from African American history. The project represented an important example of the power of the intersection of community, public art, and public history. The Black Pride Malcolm X Mural, painted by Lewis Harris in 1984 is Portland’s second oldest surviving mural. Located in what is now knowns as the Alberta Arts District at the corner of NE 17th and Alberta. This is one of Portland’s grandfathered-in community murals. Lewis Harris received an artist-in-residency grant from the Metropolitan Arts Commission (prior to RACC). He worked with students at the Black Educational Center who choose to do a mural and picked the subject matter. Originally, there was a second panel showing the continent of African and back-to-Africa advocate Marcus Garvey. It is no longer exists. The remaining panel features Malcolm X, the highly influential African-American Muslim minister and human rights activist of the 1950s and 60s. In 2015, Alberta Art Works successfully revitalized this historic mural which had begun to fade and deteriorate. Joe Cotter is known as the “grandfather of Portland murals. An artist best known for championing murals in the Portland area with his activism group called Portland Mural Defense. He wasn't an attorney but he learned about the legal process and he used that knowledge to work with a tireless group of mural advocates who fought for greater expression of murals in Portland and Oregon. Along with fellow advocates Mark Meltzer and Joanne Oleksiak of the Portland Mural Defense, Cotter worked for years to make the city sign code less restrictive toward murals. Cotter painted many murals around Oregon during the 25 years he was an active muralist, for McMenamins, Outside In, the Estacada-based cooperative called Artback, and many more, and in doing so, he collaborated with such noted artists as Isaka Shamsud-Din and Baba Wague Diakite. His last major project before his passing in 2012, was completed with his wife, Kolieha Bush, was the Buckman Community Mural at 735 SE 12th. Tom Cramer is a well-known Portland painter and scupltor. Cramer's iconic murals can be found on N Williams Ave, Tri-Met bus stations, and along Alberta. His populist style and implusive cubist linework cannot be missed. Cramer was born into the family that named PSU's Cramer Hall, and raised and educated in Portland. The first mural he painted was called Machine, at the corner of N Williams & Failing in 1989, and restored in 2002. This mural is now under-threat of redevelopment and has caused advocacy groups to rally behind its protection. The mural is protected from destruction or defamation by a 1990 Federal Law called the Visual Artists Right Act. Cramer and local artistic copyright lawyer and advocate Kohel Haver, say they will pursue legal action if developers move to tear down the mural.